Google Sign-In for the Assistant provides the simplest and easiest user experience to users and developers both for account linking and account creation. Your Action can request access to your user's Google profile during a conversation, including the user's name, email address, and profile picture. The profile information can be used to create a personalized user experience in your Action. If you have apps on other platforms and they use Google Sign-In, you can also find and link to an existing user's account, create a new account, and establish a direct channel of communication to the user. To perform account linking with Google Sign-In, you ask the user to give consent to access their Google profile. You then use the information in their profile, for example their email address, to identify the user in your system. 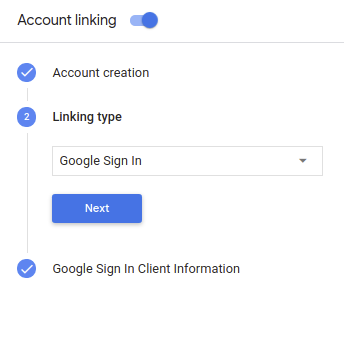 Follow the steps in the following sections to add Google Sign-In account linking to your Action. Open the Actions Console and select a project. Navigate to the Account linking section. In Account creation, select Yes, allow users to sign up for new accounts via voice. In Linking type, select Google Sign In. Open Client Information and take note of the value of Client ID issued by Google to your Actions. Warning: Don't give users a required account linking prompt at the start of the conversation with your Action. Instead, give unauthenticated users a guest flow to show how your Action works, and then only ask for account linking if it's necessary to proceed. If users are leaving the Action consistently because of account linking issues, Google will not actively promote the Action, which may decrease the Action's user traffic. Use the Account Sign-in helper intent to start the authentication flow. After the user authorizes your action to access their Google profile, you will receive a Google ID token that contains the user's Google profile information in every subsequent request to your action. Use a JWT-decoding library for your language to decode the token, and use Google's public keys (available in JWK or PEM format) to verify the token's signature. Verify that the token's issuer (iss field in the decoded token) is https://accounts.google.com and that the audience (aud field in the decoded token) is the value of Client ID issued by Google to your Actions, which is assigned to your project in the Actions on Google console. If you use the Actions on Google client library for Node.js or the Java client library, it takes care of validating and decoding the token for you, and gives you access to the profile content, as shown in the following code snippets. Note that the JSON below describes a webhook request for Dialogflow and Actions SDK respectively. // Intent that starts the account linking flow. // Create a Dialogflow intent with the `actions_intent_SIGN_IN` event. "I got your account details, "
// Create an Actions SDK intent with the `actions_intent_SIGN_IN` event. To handle data access request, just verify that the user asserted by the Google ID token is already present in your database. The following snippet of code shows an example of how to check if a user account already exists in a Firestore database. // Retrieve the user's favorite color if an account exists, ask if it doesn't. 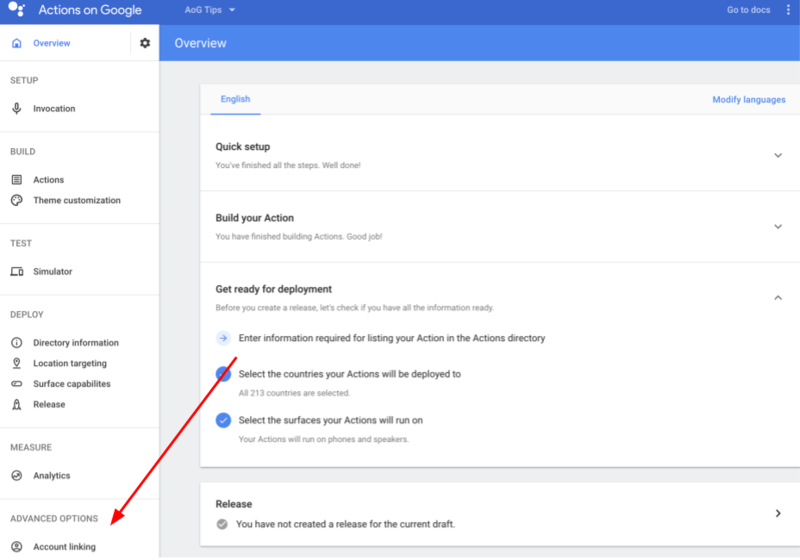 // Use the application default credentials (works on GCP based hosting).